This document is intended to help you set up the software development environment for the hardware based on Espressif ESP32. After that, a simple example will show you how to use ESP-IDF (Espressif IoT Development Framework) for menu configuration, then how to build and flash firmware onto an ESP32 board. This is documentation for the master branch (latest version) of ESP-IDF. This version is under continual development. Stable version documentation is available, as well as other ESP-IDF Versions. Powered by 40 nm technology, ESP32 provides a robust, highly integrated platform, which helps meet the continuous demands for efficient power usage, compact design, security, high performance, and reliability. Espressif provides basic hardware and software resources to help application developers realize their ideas using the ESP32 series hardware. The software development framework by Espressif is intended for development of Internet-of-Things (IoT) applications with Wi-Fi, Bluetooth, power management and several other system features. If you have one of ESP32 development boards listed below, you can click on the link to learn more about its hardware. This is a detailed roadmap to walk you through the installation process. The toolchain is a set of programs for compiling code and building applications. 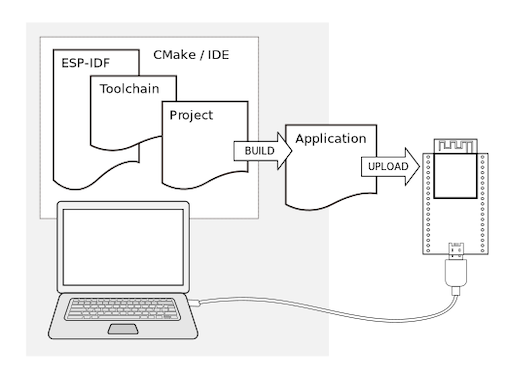 The quickest way to start development with ESP32 is by installing a prebuilt toolchain. Pick up your OS below and follow the provided instructions. This guide uses the directory ~/esp on Linux and macOS or %userprofile%\esp on Windows as an installation folder for ESP-IDF. You can use any directory, but you will need to adjust paths for the commands respectively. Keep in mind that ESP-IDF does not support spaces in paths. Depending on your experience and preferences, you may want to customize your environment instead of using a prebuilt toolchain. To set up the system your own way go to Section Customized Setup of Toolchain. Besides the toolchain, you also need ESP32-specific API (software libraries and source code). They are provided by Espressif in ESP-IDF repository. To get a local copy of ESP-IDF, navigate to your installation directory and clone the repository with git clone. Consult ESP-IDF Versions for information about which ESP-IDF version to use in a given situation. This command will clone the master branch, which has the latest development (“bleeding edge”) version of ESP-IDF. It is fully functional and updated on weekly basis with the most recent features and bugfixes. GitHub’s “Download zip file” feature does not work with ESP-IDF, a git clone is required. As a fallback, Stable version can be installed without Git. The toolchain uses the environment variable IDF_PATH to access the ESP-IDF directory. This variable should be set up on your computer, otherwise projects will not build. These variables can be set temporarily (per session) or permanently. Please follow the instructions specific to Windows , Linux and MacOS in Section Add IDF_PATH to User Profile. Now you are ready to prepare your application for ESP32. You can start with get-started/hello_world project from examples directory in IDF. There is a range of example projects in the examples directory in ESP-IDF. You can copy any project in the same way as presented above and run it. The esp-idf build system does not support spaces in the paths to either esp-idf or to projects. Now connect your ESP32 board to the computer and check under what serial port the board is visible. If you are not sure how to check the serial port name, please refer to Establish Serial Connection with ESP32 for full details. Keep the port name handy as you will need it in the next steps. Navigate to your hello_world directory from Step 5. Start a Project and run the project configuration utility menuconfig. In the menu, navigate to Serial flasher config > Default serial port to configure the serial port, where project will be loaded to. Confirm selection by pressing enter, save configuration by selecting < Save > and then exit menuconfig by selecting < Exit >. If you are Arch Linux user, navigate to SDK tool configuration and change the name of Python 2 interpreter from python to python2. If you use ESP32-DevKitC board with the ESP32-SOLO-1 module, enable single core mode (CONFIG_FREERTOS_UNICORE) in menuconfig before flashing examples. This command will compile the application and all ESP-IDF components, then it will generate the bootloader, partition table, and application binaries. After that, these binaries will be flashed onto your ESP32 board. If there are no issues by the end of the flash process, you will see messages (below) describing progress of the loading process. Then the board will be reset and the “hello_world” application will start up. If you’d like to use the Eclipse IDE instead of running make, check out the Eclipse guide. To check if “hello_world” is indeed running, type make monitor. After startup and diagnostic logs scroll up, you should see “Hello world!” printed out by the application. To exit IDF monitor use the shortcut Ctrl+]. If IDF monitor fails shortly after the upload, or if instead of the messages above you see a random garbage similar to what is given below, your board is likely using a 26MHz crystal. Most development board designs use 40MHz, so ESP-IDF uses this frequency as a default value. Go to Component config –> ESP32-specific –> Main XTAL frequency, then change CONFIG_ESP32_XTAL_FREQ_SEL to 26MHz. After that, build and flash the application again. See also IDF Monitor for handy shortcuts and more details on using IDF monitor. That’s all that you need to get started with ESP32! Now you are ready to try some other examples, or go straight to developing your own applications. Some environment variables can be specified whilst calling make allowing users to override arguments without the need to reconfigure them using make menuconfig. Overrides the serial port used in flash and monitor. Overrides the serial baud rate when flashing the ESP32. Overrides the serial baud rate used when monitoring. You can export environment variables (e.g. export ESPPORT=/dev/ttyUSB1). All subsequent calls of make within the same terminal session will use the exported value given that the variable is not simultaneously overridden. You should update ESP-IDF from time to time, as newer versions fix bugs and provide new features. The simplest way to do the update is to delete the existing esp-idf folder and clone it again, as if performing the initial installation described in Step 2. Get ESP-IDF. If downloading to a new path, remember to Add IDF_PATH to User Profile so that the toolchain scripts can find ESP-IDF in its release specific location. Another solution is to update only what has changed. The update procedure depends on the version of ESP-IDF you are using.